Sterling Audio in colloboration with "legendary engineer/producer and multiple GRAMMY® recipient Allen Sides", has designed the Sterling Audio Ocean Way Series ST6050 FET Microphone. Knowing Allen Sides' reputation the ST6050 should be a stellar performer in the current crop of microphones. "The ST6050 was inspired by Ocean Way’s expansive collection of microphones, all with exceptional sound quality and unique sonic characteristics that span many decades and musical eras. By combining classic capsule and FET design with modern manufacturing techniques, the ST6050 yields stunning clarity with a rich, warm, open sound and a silky top end that exquisitely captures vocals and acoustic instruments." "The capsule on the ST6050 is one inch in diameter, eight microns thick and gold-sputtered, built with traditional machining and exceptionally tight manufacturing tolerances. Each is hand-assembled and tested." "The ST6050 has a robust transformer design with side-by-side windings that yield an even low-frequency response while maintaining openness and top-end air. The chassis consists of a chrome-plated, woven-brass grill with steel head frame, plus a heavy brass body with chrome plated closing ring. 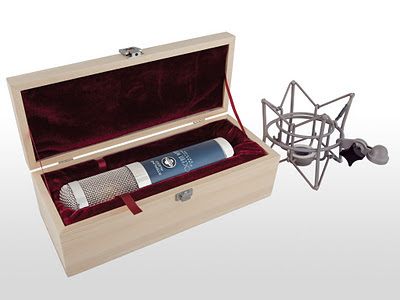 The ST6050 microphone package includes a SM-7 shock mount, attractive wood storage case and windscreen." Robust transformer design with side-by-side windings yield even low frequency response while maintaining openness and top-end air. SM-7 shock mount, Windscreen, Wooden storage case. ST6050 MSRP $1699.99 but you can pre-order for $999 at GC-Pro.